A man charged with murder and other counts in a shooting and fiery crash on the Las Vegas Strip nearly two months ago has been extradited from Los Angeles to Nevada. 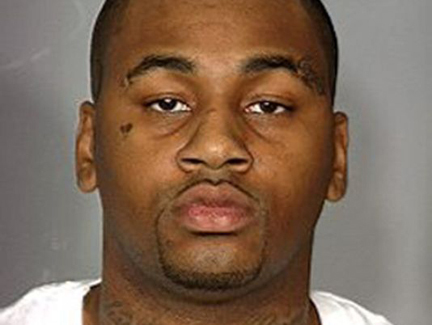 Ammar Harris, 27, was released just after 11:30 p.m. Monday to Nevada law enforcement officials, according to jail records. Harris was returned to Clark County, Nev., where he was awaiting a court appearance on Wednesday, according to Tess Driver of the Clark County District Attorney's Office. He had been jailed in Los Angeles since his arrest at a Studio City apartment complex on February 28. After examining photographs and fingerprints, Los Angeles Superior Court Judge Shelly Torrealba said she determined last month that Harris is ``the same individual'' being sought by the state of Nevada. Authorities allege that Harris opened fire Feb. 21 from a Range Rover on Oakland-based rap artist Kenny Clutch, legally known as Kenneth Wayne Cherry, after a verbal altercation. The fatally wounded Clutch crashed the Maserati he was driving into a cab that burst into flames, killing taxi driver Michael Boldon and passenger Sandra Sutton-Wasmund. A criminal complaint filed Feb. 22 in Nevada charged Harris with 11 counts, including three counts of murder with use of a deadly weapon, one count of attempted murder, two counts of discharging a firearm at or into a vehicle and five counts of discharging a firearm out of a motor vehicle.